I have to laugh when I realize I've only actually reviewed one book by an author I glommed onto quite awhile back. Jill Shalvis first came to my attention through her well-known (and loved) Lucky Harbor series. I really enjoyed the first book, Simply Irresistible, and proceeded to blow my way through the rest of the series. I originally thought it would be just a trilogy, but it has turned into quite the expansive series. Interestingly, the series as a whole is informally broken up into sets of three mini-trilogies if you will, within the larger whole. It Had to Be You is the first book in the third trilogy. I find readers tend to fall all over the map when it comes to their favorite Lucky Harbor installments, a fact which delights me. When recommending them to new readers, I usually tell them to start with Simply Irresistible, but that it's anyone's guess which ones will wind up being theirs. As for me, the first book in each trilogy sits on my keeper shelf. Maddie from Simply Irresistible, Mallory from Lucky in Love, and now Ali from It Had to Be You are my girls. The ones I connected with immediately and that I can tell I will return to in the future. Ali Winters doesn't let much get her down but, given the events of the last 24 hours, she's starting to wonder if it maybe isn't time to throw in the towel. Cause when the guy you thought was your boyfriend turns out not to be, the house you thought was your home turns out not to be, and the job you thought was going somewhere turns out not to be, well . . . it's kind of more than a pint of Ben & Jerry's and a pedicure can fix. Add to that the fact that the non-boyfriend has accused her of theft and the local police department is breathing down her neck, and Ali's forced to rethink her adopted home of Lucky Harbor. But then the actual owner of the house she's been squatting in for the past few months arrives fully intending to occupy it. Alone. Detective Lieutenant Luke Hanover left Lucky Harbor a long time ago and hasn't been back since. He wouldn't be back now except his high profile case in San Francisco went bad fast, and the only thing he could think of was retreat to his old home to attempt some sort of recovery before burnout claims him for good. Neither one of them is looking for a roommate, but they also neither one have anywhere else to go. And so Luke and Ali find themselves cohabiting just until Ali can find another place. Determined to clear her name, she also embarks on a campaign to find the real culprit. A reluctant Luke gets sucked into the search, and before long they're well on their way to being something more than roommates. It was surprisingly good to be back, you guys. I mean, this being the first in the latest set of three, I kind of had a feeling it would work for me. And maybe I was in precisely the right mental space, but I just thoroughly enjoyed this seventh Lucky Harbor novel. It felt slower to me than its previous two siblings, unrushed and content to allow its likable protagonists the space they needed to figure things out. You always know what you're getting with Lucky Harbor, but some setups and characters simply bear more weight than others. For me, Ali and Luke hit that perfect pitch of adequately complicated backgrounds and understandably conflicted presents. I felt for them both very soon after making their acquaintance, and had no trouble at all wanting to spend as much time with them as possible. The mystery plot folded into the story nicely without ever getting annoying, and the very real ways in which these two came to rely on each other made their slow incline toward one another that much more appealing. They were two very self-aware people, acquainted with tragedy and familiar with the coping mechanisms required to carry on. That's why I liked them both so, I think. They did just that--they carried on. Mutual admiration and solid affection came to make up so much of their attraction, adding an extra layer of emotion for me as a reader. Watching them individually and collectively realize what really lay between them and just not believe that they could hold onto it kept me up late turning pages. I can tell I am sliding into full-on summer reading mode, and It Had to Be You was such a great read, full of heart and light and all things summer. 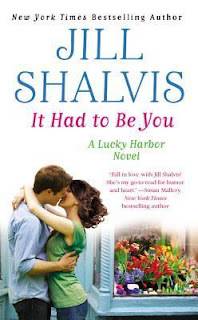 Book Binge - "Jill Shalvis has delivered another Lucky Harbor book that delivered the laughs and introduces a bunch of new characters that wormed their way into my heart." The Bookpushers - "Shalvis fans will be glad to be back in Lucky Harbor and seeing all the usual suspects." Dear Author - "Ms. Shalvis shows Ali and Luke caring for–taking care of–each other in ways that make their falling in love believable." Fiction Vixen - " I thoroughly enjoy Ms. Shalvis’ writing and this series." Harlequin Junkie - "I connected right away with both Ali and Luke." My Keeper Shelf - "The chemistry between Ali and Luke was a bit of a slow burner for me." Smexy Books - "Cute summer read." I don't know how I completely missed this series. Where would you suggest I start? Simply Irresistible? Yep, start with Simply Irresistible. It introduces the town and has a great couple/story. Then I say give this one a shot. Or Lucky in Love. Those are my three faves. I love this series and I've read them all in order, but Lucky In Love is my favorite. I think It Had to Be You is a close second. Another great series that also does the mini-trilogies is the Fool's Gold series by Susan Mallery. Her new one Just One Kiss is as great as this book. Is it? That makes me happy to hear, Lesley. Mallory & Ty were awesome. I haven't read any Mallery before, though I've heard of her Fool's Gold series. Thanks for the rec. I was wandering the library shelves the other week and randomly grabbed "Lucky in Love" because I remember someone saying they liked Jill Shalvis. It must've been you :) "Lucky in Love" didn't quite work for me, but I had enough fun with it that I'll probably be randomly grabbing another of Shalvis's books next time I'm at the library to give her another go. Glad it didn't turn you off completely. You might like Maddie and Jax more, from Simply Irresistible. Maybe grab that one next time you're feeling like giving it a go. I must be more out of the loop than I realised. I didn't even realise this was out already!